This page has been developed as a “one-stop-shop” of all the Capital Campaign updates since October 2018. Please be sure to check it often for updates. This is such an exciting time for our parish and we are eager to share with parishioners what is happening! Click here to read or print the campaign brochure. A Campaign Pledge Form can be found by clicking here. And, as always we ask all to join our community in prayer for this project! We have $3.65 million pledged and achieved 59 percent participation in our Capital Campaign. Let’s keep it going! and energy so many have put into this campaign and turn your pledge in today and save them at least one phone call or visit! We are doing a wonderful thing in building our church and our church community. Thank you to those who have supported us this far. If you need envelopes for your Capital Campaign contribution, they are available at the Information Table. We prayerfully ask those who have not made their pledge to please do so. You may pick up a pledge form at the Information Table. March 3, 2019 – $3,600,937 in Gifts & Pledges to Date! The Let’s Do Something Beautiful for God Capital Campaign completed the in-pew pledge drive on February 10 and 17. To date, we have $3,600,937 in pledges with 57% of the community participating. As you may recall, one of Father Daniel’s campaign goals is 100% participation from our community. The campaign is based on equal sacrifice, not giving… All gifts, no matter the size, are needed and greatly appreciated. This simple line from the Old Testament presents us with two challenges. First, do we bring God the best that we have to offer; regarding our gifts of time, talent and treasure, do we give God our “first fruits” or what is leftover? Second, do we remember that everything we have has been given to us by God? We brought nothing into this world and we can take nothing from it. So let us ask God for a grateful and generous heart, every day. February 17, 2019 – Why Do We Need to Build Now? One of the questions we continue to receive is, “why do we need to build now?” There’s not just one simple answer, but many compelling reasons why building now is the right thing to do, both from financial and spiritual perspectives. Our rent at Green Hope High School is about $60,000 per year. This includes renting the auditorium for weekly Masses, the gym for Christmas and Easter, and nine classrooms for our Faith Formation program. Green Hope HS has been a good landlord, but our rental agreement with Wake County Public Schools is on a yearly basis with no guarantee for renewal. Our tabernacle is mobile. Father Daniel takes the Blessed Sacrament to and from the rectory on Sunday morning. The Eucharist needs a permanent home. It requires an incredible amount of effort to transform a high school cafeteria into a vestibule, an auditorium into a sanctuary, and a stage into an altar. Every week, about 15 volunteers set up and 15 volunteers tear down our vestibule, sanctuary, altar and Faith Formation classrooms. Christmas and Easter Masses require about five times that number of volunteers. We will not become a parish until we have a dedicated worship space of our own. Until then, we will be a “Mission”. As a Mission, we are dependent on St. Michael, our sponsor parish. As our sponsoring parish, St. Michael has been extraordinarily generous to us: they purchased and gifted us our land on Yates Store Road, they provide us rent-free office and administrative space as well as storage. We’ve been very blessed by St. Michael’s parish. As a mission, we have no place to properly hold our own special sacramental and liturgical celebrations such as funerals and weddings. St. Michael the Archangel is very generous to let us use their church for such liturgies. We are told in Matthew 28:19 to, “Go, therefore, and make disciples of all nations, baptizing them in the name of the Father, and of the Son, and of the Holy Spirit.” Jesus commands his disciples to evangelize. We can all have a very tangible part in evangelization by bringing God’s living presence to Yates Store Road. Thank you so much for responding to the in-pew pledge campaign last Sunday. If you haven’t already done so, please complete a pledge form so we can reach our goal of 100% participation. We continue to push towards $3.5 million, but we need to set our sites beyond that dollar amount. We heard last week we’ve had a few curve balls thrown at us, that can be expected when taking on such an amazing endeavor. This means we can’t let up. We truly need your participation in this capital campaign. It will make a difference. Please make your pledge now, payable over the next three years, to help us build our community. For those of you interested in fulfilling your pledge via the Mother Teresa We Share online giving site, that option will be available later in the month of February. In the meantime, even if you are planning to give online, we still ask that you fill out a pledge form to help the Mother Teresa office track our progress towards our goal of 100 percent participation. Christmas is over, and we are back to work on building something beautiful for God. A couple of questions have come up consistently over the past month. First, “what is next, aside from working to get everyone to pledge?” For the Capital Campaign Committee, providing every single member of our church the opportunity to participate in this important work is our No. 1 goal. That is what’s next. What is exciting is the answer to the next question we have been hearing, “How are we doing? And not just at a high level, but provide us some detail.” Here is a chart that lays out the four phases of the campaign and how each phase is performing. Note that it was necessary to break the campaign into four phases to manage the amount of work needed to be done. You can see the progress we have made, especially in the first two phases. It’s also evident there are many pledge forms still lying on countertops or desks in the homes of our parishioners just waiting to be turned in. The Capital Campaign Committee will continue to work to get each of those pledges turned in. What’s exciting about that? To date, the average pledge is $13,250. If Mother Teresa Mission, as a community, is able to get every family to see the benefit of supporting this cause and we can continue to have pledges come in at or near the current average, it would be one of the most successful campaigns we could have ever hoped for. That’s exciting. That’s what keeps us moving forward and working to collect pledges. Please fill out a pledge form after Mass or mail in the one that’s been lying on your countertop the past few weeks. Our cause is worthy, but we cannot do it without everyone participating. January 6, 2019 – What’s Next in the Capital Campaign? One year ago, none of us knew exactly where 2018 would take us in our personal, professional, or spiritual lives. None of us, except maybe Father Daniel, had any idea what was in store for Mother Teresa Catholic Mission. But after a short break in December, to allow us all the opportunity to focus on Advent and the birth of Jesus, here we are today, poised to conclude a truly remarkable capital campaign. Why has our capital campaign been remarkable? Because of you, the parishioners of Mother Teresa Catholic Mission. You have made this remarkable. You have welcomed us into your homes. You have asked questions, provided feedback, and submitted pledges that show you are committed to building something beautiful for God on Yates Store Road. As has been said, the most recent estimate of the cost of developing the site and building a worship space in phase one will be at least $5 million. There is no reason for us to stop the capital campaign simply because we have surpassed our stretch goal of $3 million (we are now above $3.4 million!). As we continue to receive more pledges, we are lowering our future debt burden which will allow us to focus resources on other programs in our community. Over the coming weeks, you will have the opportunity to complete your pledge and join us as we endeavor to achieve 100 percent participation. We’ve been told, “100 percent participation cannot be achieved,” but we will work towards that goal because we see each and every week what our parish is capable of and how amazing each and everyone of you are! What we ask of you is to please submit your pledge form as soon as you can. You can continue to mail pledges to the Mother Teresa mailing address or place them in the offertory baskets with your weekly donation. Additionally, we will have pledge forms available in pews soon to make it as easy as possible for you to fill out your pledge. If you’re not a registered parishioner here, please register now. We’d love to have you join our family. However, you are not required to register in order to fill out a pledge form and support our capital campaign to Build Something Beautiful for God. Should you have any questions, please seek out one of the members of the Capital Campaign Committee after Mass or feel free to email us at mtcccapitalcampaign@gmail.com. Please continue to pray for our mission parish and our capital campaign. Thank you. December 24, 2018 – Merry Christmas from the Capital Campaign Committee! You can certainly imagine that the Capital Campaign Committee is very thankful for the many generous and sacrificial financial gifts, and countless hours of volunteering given to the Capital Campaign. But far more important than the financial gifts, we’re all grateful for the many new friendships created and amazing stories that have been shared in the process. Thank you for welcoming us into your homes, or coming into ours, all in the name of helping to build our community. May your Christmas be filled with love and joy! Well, by the time you read this, we will have hit our financial stretch goal of $3 million for the Capital Campaign! This is no small accomplishment, and we want to thank all of you who have already made your pledges. However, when it comes to the success of this campaign, a more important question is, “Where do we stand with regards to participation?” We‘re doing quite well. Approximately 190 families have participated as of this past weekend. Many more have verbally agreed to participate but are still prayerfully considering their sacrificial gift. We continue to encourage them to turn their pledge cards in as soon as they are able. As Father Daniel has said many times, we’re not just building our church home, we’re building our church community. Please help us build our community by turning in your pledge card. Remember that every dollar we raise beyond $3 million will help in lessening our mortgage debt and allow us to grow as a community in more ways than we’re able to at Green Hope HS. Our Let’s Do Something Beautiful for God Capital Campaign is gaining momentum. Sacrificial pledges to date are now more than $2.5 million. We’ll continue working hard to meet our stretch goal of $3 million over the coming weeks. From Mike DiFiore to Msgr. Wall, we have heard some wonderful messages about the work being done, the value of sacrificial giving, and the vision we share. If you missed Msgr. Wall’s homily a couple of weeks ago, it is certainly worth a listen: mtccary.org/building (special thanks to Bob Witchger). If you’ve made your pledge, thank you. If you’ve been called or have met with a committee member, but have not yet confirmed your pledge, please consider doing so as soon as possible. If you’ve not been contacted, be ready. We’re making our biggest push this coming week. Please let us know if you have any questions: mtcccapitalcampaign@gmail.com. Being in the middle of a capital campaign makes it easy to turn every scripture reading into something about, or relating to, our capital campaign. No, I don’t think every bible verse is about raising money. I relate this one more to our journey from a satellite due to overflow at St. Michael, to a mission, and eventually, to Mother Teresa Catholic Church. As we work towards the goal of becoming Mother Teresa Catholic Church, I want to let you know that I have been having a lot of fun during this campaign. I’m enjoying getting to know many of you while raising money for our worthy cause. 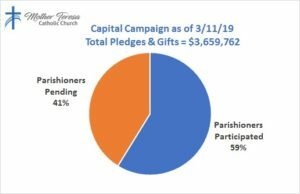 The Capital Campaign Committee has chosen to have positive attitudes about raising money for our parish, rather than viewing it as a grueling necessary task. As you read this, think about your interactions with your fellow parishioners and consider how you feel every time you leave Green Hope HS after Mass on Sunday morning; it is no wonder that I have been having fun. Yes, but what type of building are we building? I would love to build a church first, but the math is hard to make work without someone writing a check for a few million dollars. That is not expected to happen. So, we will build a dedicated worship space. In some ways, I think that’s fitting. We’ve waited 18 years just to get to this point, so finally having our own space will be a monumental achievement. The church will follow at some point in the future. Several have suggested we need to have a thermometer to show our weekly progress. It’s something we’ve considered. But recently, it was brought to my attention that those campaign thermometers either reach the top too quickly, and everyone becomes complacent — or the thermometer never reaches the top, and everyone sees failure. Personally, I never saw Mother Teresa walking the streets of Calcutta measuring her success with a thermometer. Likewise, I’m certain Mother Teresa Catholic Mission cannot measure where we have come from or where we are going with a thermometer. We will reach our stretch goal for this campaign, but that will not be a stopping point. The one thing I’ve realized from this process is that building our parish community is equally as important as building our parish building. Therefore, 100% participation means far more than $3,000,000. Having the very last parishioner continue to prayerfully consider a sacrificial pledge and submit that pledge card long after we pass $3,000,000 is a goal that we can all be proud of, and one that no thermometer will be able to accurately measure. The Capital Campaign Committee continues to look forward to sharing updates along the way and answering your questions when we are able to. Thank you. Even though the altar set on the Green Hope stage seems to magically appear every Sunday, we all know there’s been significant work going on the background. Similarly, there’s been a lot of work going on in the background for the capital campaign. 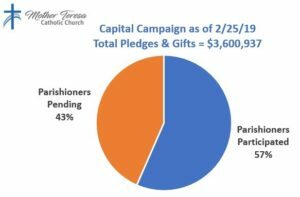 As we continue to reach out to more and more parishioners, you will all continue to see the capital campaign come to life. We ask for a bit of patience if you have not yet been contacted. We’ll continue to do our best to keep reaching out. For those of you have been able to support us so far, thank you. We’ll keep you informed over the coming weeks. We look forward to sharing a comprehensive update with you soon. Please continue to pray for the success of our capital campaign. Capital Campaigns don’t just happen. There must be a strong desire by a significant group of individuals for a capital campaign to take flight. Gratefully, the desire for this campaign is stronger than we even anticipated. We have all been praying for this to happen for many years. 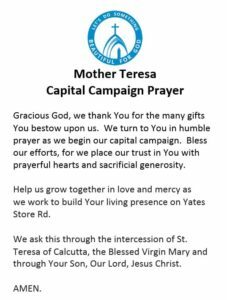 Over the past few weeks, the Capital Campaign Committee has been busy reaching out to parishioners for assistance in building the campaign. Building the campaign is more than raising money for a worship space; it is building our parish for future generations. Presently, building the campaign consists of recruiting parishioners who are willing to share the vision of Mother Teresa Catholic Mission with others, and then ask for financial support to make that vision happen. In the end, the payoff for all of us is a stronger parish for the future. So as Fr. Daniel has asked, please be receptive of the Capital Campaign Committee when they reach out to you. They are not calling for their own good, but for the good of building the campaign, building our parish, and building something beautiful for God.